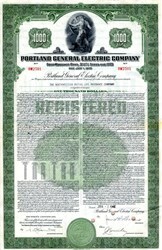 Beautifully engraved $1000 bond certificate from the Portland General Electric Company issued in 1946. 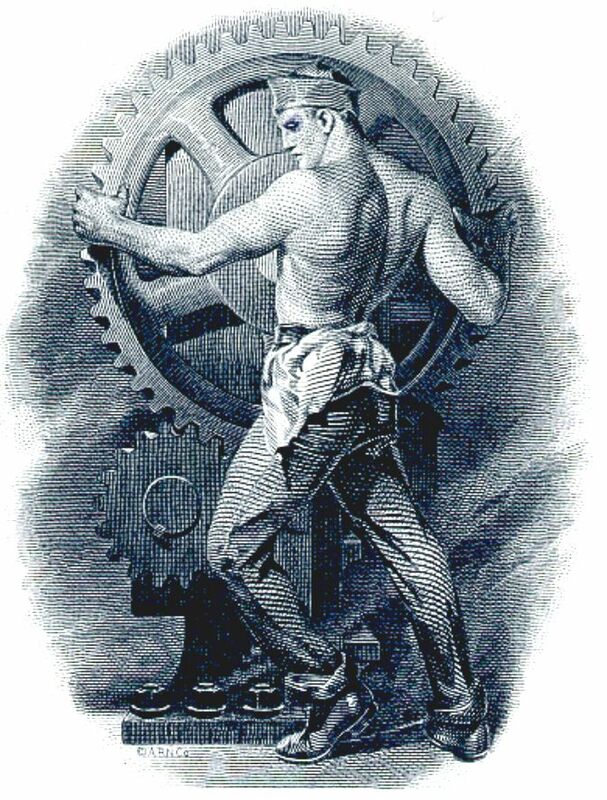 This historic document was printed by the American Banknote Company and has an ornate border around it with a vignette of laborer using shear strength to turn a large iron rotator. This item has the handwritten signatures of the Company�s President, Assistant Secretary, and an authorized officer; and is over 65 years old. Portland General Electric (PGE) (NYSE: POR) is an electrical utility based in Portland in the U.S. state of Oregon. It distributes electricity to customers in parts of Multnomah, Clackamas, Marion, Yamhill, Washington, and Polk counties - half of the inhabitants of Oregon. (The rest of the City of Portland is served by Pacific Power.) Founded in 1888 as the Willamette Falls Electric Company, the company has been an independent company for most of its existence, though was briefly owned by the Houston-based Enron Corporation from 1997 until 2006 when Enron divested itself of PGE during its bankruptcy. PGE produces and purchases energy primarily from coal and natural gas plants, as well as hydroelectric power from dams on the Clackamas, Willamette and Deschutes rivers. Between 1976 and 1993, PGE operated Trojan, the only nuclear power plant in Oregon. The utility was founded in 1888 by Parker F. Morey and Edward L. Eastham as Willamette Falls Electric Company. On June 3, 1889 it sent power generated by one of four "No. 8 Brush arc light dynamos" at Willamette Falls over a 14-mile electric power transmission line to Portland ... the first US power plant to do so. On August 6, 1892, Morey, Frederick Van Voorhies Holman, and Henry Failing formed the Portland General Electric Company. It was funded by General Electric and the investment arm of Old Colony Trust, with $4.25 million in capital. PGE purchased Willamette Falls Electric in 1892. In May 1893, PGE purchased the City-Eastside Electric Light Plant, a municipal power company. MacColl called it "a generous gift to a private company at the expense of future taxpayers" since it was constructed for a cost of $40,342 and sold 15 months later for $27,000. PGE also purchased the 1891 Union Power Company in 1905, the 1889 Albina Light & Water Company in 1892, and the 1892 Vancouver Electric Light & Power Company in 1906. PGE, Portland Railway Company, and Oregon Water Power & Railway Company merged in 1906, becoming the Portland Railway, Light and Power Company (PRL&P). It was the only streetcar operator in city limits, and was the predecessor of the modern PGE. Willamette Falls Electric changed its name several times before settling on Portland Electric Power Company (PEPCO) in 1932. Portland Electric Power was reorganized as PGE in 1948. On March 1, 1939, the PEPCO defaulted on interest bonds issued in March 1934. The bonds were pledged with PGE (the electric subsidiary) and Portland Traction Company (PTC, streetcar subsidiary) as collateral, with Guaranty Trust as trustee. PEPCO filed for Chapter X bankruptcy (now known as Chapter 9) on April 3, 1939, and was assigned District Judge James Alger Fee. The proceedings were later called "one of the most prolonged and complicated series of legal proceedings in Portland's history". The reorganization and bond default was brought on by PGE's difficult negotiations with Bonneville Power Administration, the death Seattle City Light's visionary J. D. Ross, and the indecision created by the possible creation of a Public utility district in PGE's territory. The Columbia Valley Authority project would have allowed CVA to purchase utilities such as PGE. PGE survived from bankruptcy through selling Portland Traction in August 1946 for $8 million in cash, cheap power purchases from BPA beginning in the fall of 1939, and net profits by the end of 1941. In the meantime, Ormond R. Bean, the Oregon Public Utility Commissioner, forced PGE to lower its rates. Ultimately, PEPCO and PGE were saved by World War II, which led to the construction of three Kaiser Shipyards and of Vanport City, Oregon to support them. By 1945, PGE derived nearly $400,000 in revenue from the two Kaiser shipyards in Oregon. Judge Fee ruled the bankruptcy reorganization complete on June 29, 1946. Ballot measures have been filed by citizens several times since the 1960s to convert some or all of PGE into a Public Utility District (PUD), the latest of which was in 2003, and most have been unsuccessful. An exception was in 1999, when PGE announced it was selling its customer base in St. Helens, Scappoose, and Columbia City to West Oregon Electric PUD for $7.9 million. The terms of this sale would leave the physical assets of the distribution system�the poles, wires and other components�owned by Enron, who would then manage this system as a contractor exempt from state regulation. Voter distrust of both Enron and PGE was severe enough for them to approve the measure, despite $71,592 being spent in advertisements to oppose it, in comparison to the $2,304 spent by supporters. This resulted with those three cities becoming part of the Columbia River PUD on terms far more favorable to the customers; electricity rates immediately dropped in these cities, and remain lower than those for current PGE customers. On July 1, 1997, Enron Corporation bought PGE for $2 billion in stock and $1.1 billion in assumed debt. Then in 1999, and again in 2001, Enron attempted to sell PGE to other investor-owned utilities including Portland based NW Natural. The corporate officers of PGE claimed that this utility was not involved in the financial misdealings of its owner, pointing to the fact that many of its employees suffered when Enron froze the 401(k) retirement plan and were unable to sell the rapidly declining stock. However, Ken Harrison and Joseph Hirko, PGE's CEO and CFO respectively at the time of the Enron merger were charged on several felony level counts primarily related to financial misrepresentation regarding Enron Broadband Services which had its headquarters within the World Trade Center complex that comprises PGE's corporate offices. In addition Tim Belden, head of the West Coast Trading Desk and John Forney, an energy trader who invented various electricity trading strategies such as the Death Star, operated from the trading floor in the PGE corporate offices and were also convicted of financial crimes related to the California Electricity Crisis.